When was the last time you walked up the gangway, scanned your ship identification card, and set sail? Whether you’ve sailed recently or it has been a few years since you’ve been a passenger, you need to take a cruise this year or you will miss out on very exciting opportunities on board and in ports. It doesn’t matter what cruise line you enjoy most, what cabin you consider booking, where you’ll be embarking or where you’d like to sail. There are always exciting things happening on cruise ships and in their ports of call, and this year is filled with amazing cruise opportunities. Every major cruise line is expanding its fleet, launching new ships with innovative features not found on older vessels. These new ships are typically larger and more advanced, with updated technology and unexpected surprises. At the same time, as new ships arrive, smaller, older ships will have more vacancies for passengers to enjoy their classic, more intimate atmospheres at great rates. As new ships are being built, some older, smaller ships are being retired. In some cases, these ships are being rebuilt and renovated so extensively that they become new ships, while in other cases they may be transferred to other lines or sold or scrapped entirely. Cruise enthusiasts who like to experience different ships won’t want to miss the opportunity to add these classic ships to their collection. Worth Reading: The Former Carnival Cruise Ships, Where Are They Now? There is more to explore than ever before as cruise lines are adding unusual and unique itineraries to their schedules. New embarkation ports such as San Francisco are available, while cruises to Cuba, Australia, and China are more popular than ever with more options available for all passengers to enjoy. Longer cruises exploring destination cultures and repositioning itineraries offering unique experiences are other great options for cruisers this year. With economic growth continuing, cruise lines are tempting travelers with a variety of amazing deals for every vacation budget. Cabins for single travelers, discounts for military veterans, past passenger special rates, and other fantastic deals are available for many different sailings. As more ships are launched, rates for older ships and more common sailings are getting even cheaper. As new ships are being built and older ships are renovated, cruise lines are introducing even more amazing features on board. Go karts, skydiving, bumper cars, ropes courses, robot bartenders, escape rooms, trampolines, and even roller coasters can all be found on upcoming ships, and are just a few of the outstanding features cruise ships are offering this year. Cruise ships are well known for their cuisine and unlimited food options, and there is even more tastiness to try in the coming year. Exclusive brewery-at-sea selections, sushi bars, onboard chocolatiers, juice bars, gluten-free menus, smokehouses, and a variety of dining experiences give guests the opportunity to taste amazing creations and even join cooking classes on this year’s cruises. If it’s fitness you’re into, you can make your workout even more amazing on a cruise. Updated fitness facilities with state-of-the-art equipment, personal trainers, and fitness classes from yoga, pilates, and tai chi to spinning and bootcamp options are all available. Yet don’t forget to relax after your workout with exclusive spa treatments, thalassotherapy pools, and detoxification regimens. Our lives are more stressful than ever, and a traditional vacation can add to that stress as you handle all the arrangements yourself. On a cruise, however, all the planning, cooking, cleaning, navigating, and even activities are taken care of for you. Furthermore, a cruise is the perfect opportunity for a digital detox if you want to feel truly disconnected from the stresses of daily life. Private islands are quickly becoming favorite ports of call for both new cruisers and past passengers, and for good reason. These exclusive destinations are much more than just a great day at the beach, but are being updated and expanded to include a variety of shore tours, local entertainment, water parks, exciting contests, and amazing food – everything that makes a cruise great, all in one fun stop. 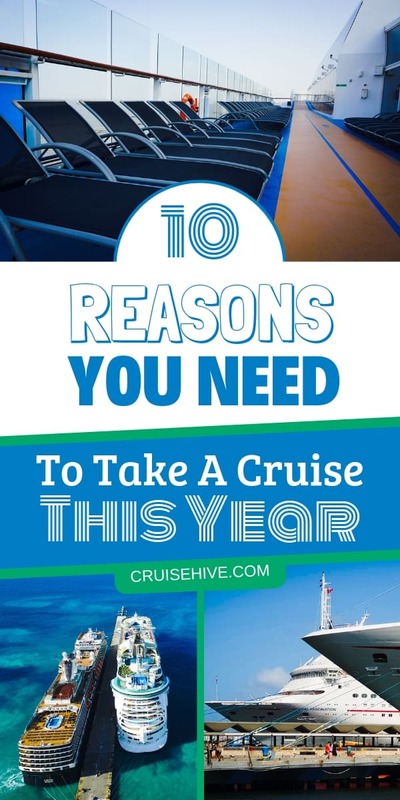 This year’s cruises aren’t just for senior travelers, beachgoers, or the party crowd, but there are options for everyone. New children’s and teen programs are available, and shore tours and excursions offer everything from laid back shopping and history tours to ATV adventures, horseback riding, bar hopping, parasailing, watersports, SCUBA diving, wildlife watching, and voluntourism. There is something for all ages to enjoy on their cruise of a lifetime. With so many reasons to set sail this year, what are you waiting for? Bon voyage!